If there’s one thing I love it’s a big steaming pot of freshly brewed herbal tea. A well crafted herbal tea blend is like drinking a giant cup of love. 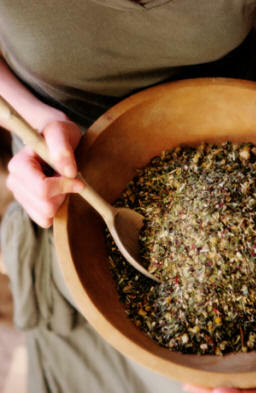 Here are some tips on how to transform ordinary herbs into a synergetic blend. To understand the alchemy of tea blending, start by learning the flavors of individual herbs in order to develop a mental taste or scent for each herb. This will give you an understanding of where the herbs belong in a blend. Achieving a well-rounded blend requires balancing the scents, or notes, in the mixture. Consider each herb as having a predominant note – either a top, middle, or base note. Top Note – The top note is the peak of the blend. It is sharp, penetrating, light, and airy. It is the flavor that hits you initially, and will stand out in a blend. This should consist of 10-25% of the blend since it can easily overpower. 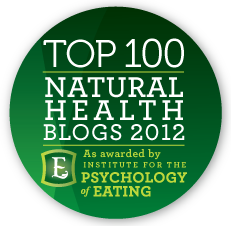 Examples of top note herbs are Citrus, Mints, Thyme, Sage, and Lemongrass. Middle Note – The middle note is the body of the blend. It is mellow, soothing, soft, and neutral. The middle note will round out and balance a blend. This should consist of 40-80% of the blend. 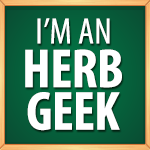 Examples of middle note herbs are Chamomile, Chicory, Nettle, Chickweed, and Rosemary. Base Note – The base note gives depth to the blend. It is heavy, dense, deep, and earthy. It will ground the blend, and give it its roots. This should only consist of 5% of the blend. Examples of base note herbs are Ginger, Sarsaparilla, Vanilla, Yarrow, and Burdock. Next, experiment with different sweeteners and learn how to make your blend pleasant to drink. When blending herbal teas, one must often include herbs that are medicinally useful, but have unpleasant flavors. Sweeteners are great additions for making herbal tea blends palatable to drink. Sweeteners – The sweetener herbs add flavor to a blend, counter medicinal and bland tastes, and make the tea enjoyable to drink. Examples of sweetener herbs are Anise-Hyssop, Crystal Malt, Stevia, Licorice, Mulberry, and Jujube. Finally, consider the overall esthetics of the blend, and make it pleasing to look at. This is an important factor in making the tea desirable. Esthetics – The esthetic herbs make a blend appealing. Use contrast in texture, shape, and color. Examples of esthetic herbs are Chrysanthamum, Sunflower Petals, Calendula, Roses, and Star Anise. Following these simple guidelines will help you to create herbal tea blends that are medicinally effective, pleasant to drink, and energetically appealing. Most importantly – have fun, experiment, and be creative! My name is Ryan, and i cant tell you how excited i was to come across this post! Recently i have decided to try and supplement my lifestyle of constant activity and love for the gym with a herbal tea, instead of all the chemicals that are now thrown at us. Safe to say, im a bit overwhelmed at the moment. I appreciate you are a busy person, and any input by you or anyone at this fantastic website is sure to help. I look forward to a reply and i appreciate any time given to one so much.